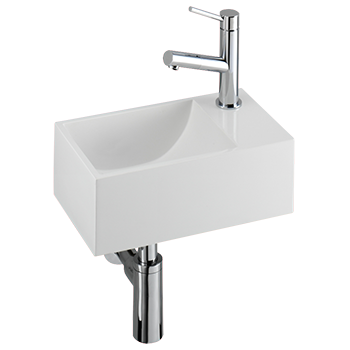 Cloakroom basin 300 x 180 mm, in Ceramic, colour white, taphole right (or left), no overflow, set of bolts included, accessories as indicatet. 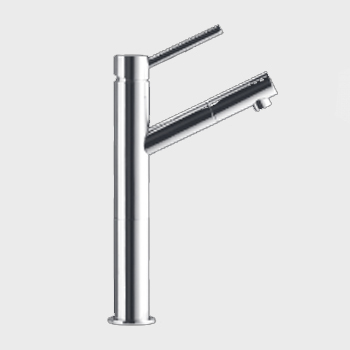 Dickwandiges, schmales Handwaschbecken aus Keramik, 360x180mm, Farbe weiß, Hahnloch rechts (wahlweise links), ohne Überlauf oder Ablagefläche, flaches Design, inklusive Befestigungsset, mit wahlweisem Zubehör wie angegeben. 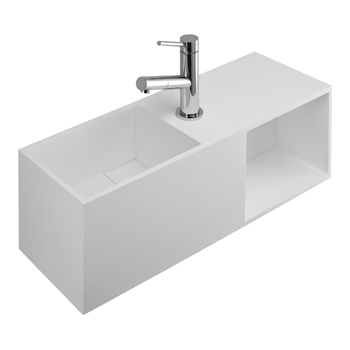 Dünnwandiger, extravaganter Designerwaschtisch aus Keramik, 400x180mm, mit umlaufendem Rand und versenktem, flachem Haubenventil aus Keramik. 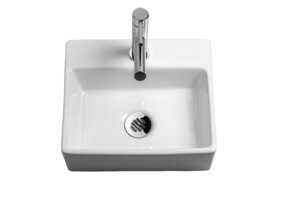 Nur mit Hahnloch rechts lieferbar, inklusive Besfestigungsset, mit wahlweisem Zubehör wie angegeben. 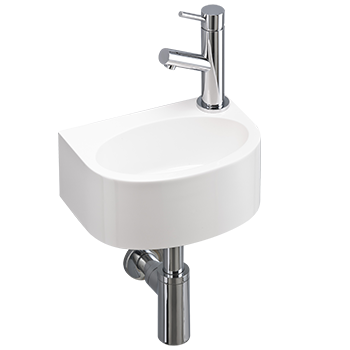 Cloakroom basin 300 x 225 mm, in Ceramic, colour white, taphole right, no overflow, set of bolts included, accessories as indicatet. 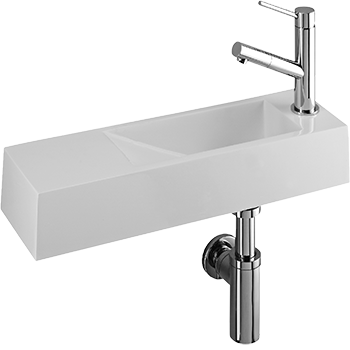 Originelle Handwaschbecken im Form einer Trillerpfeife, 390x230mm, aus Keramik, Farbe weiß, Hahnloch rechts (wahlweise links), ohne Überlauf. 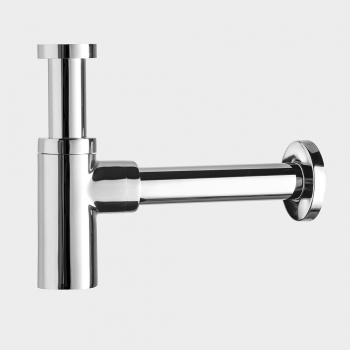 Der schmale "Balken" ermöglicht das Öffnen der Tür selbst in kleinsten Gäste-WC's, und dient gleichzeitig als Seifenablage. 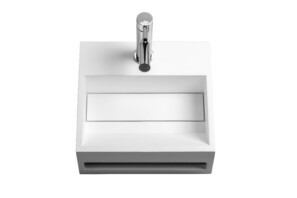 Inklusive Befestigungsset, mit wahlweisem Zubehör wie angegeben. 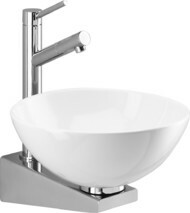 Besonders kleiner Waschtisch, mit Design-Effekt durch massive Wände und abgerundete Innenecken. 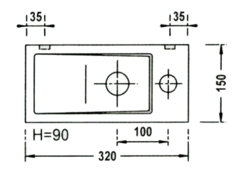 Mit 80mm Hahnbank. 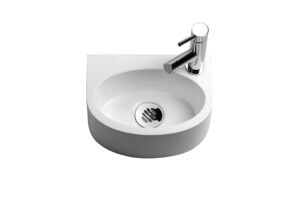 Cloakroom basin 340 x 290 mm, in Ceramic, colour white, central taphole, putdown space 80 mm, no overflow, set of bolts included, accessories as indicatet. 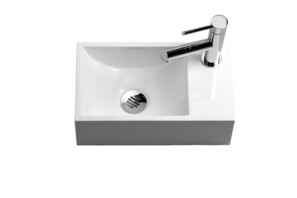 Größeres Handwaschbecken aus Keramik, in rechteckiger Form, mit Ausbuchtung mittig, 440x250mm, Farbe weiß, Nur in der Version Hahnloch rechts, Ablage links lieferbar, ohne Überlauf, inklusive Befestigungsset, mit wahlweisem Zubehör wie angegeben. 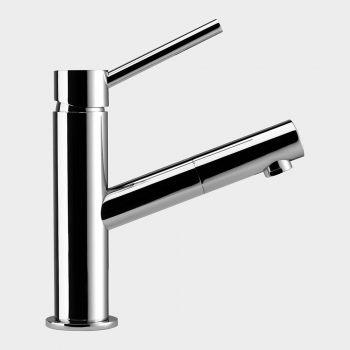 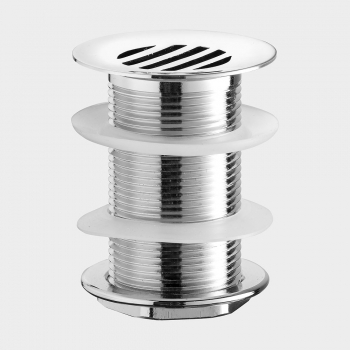 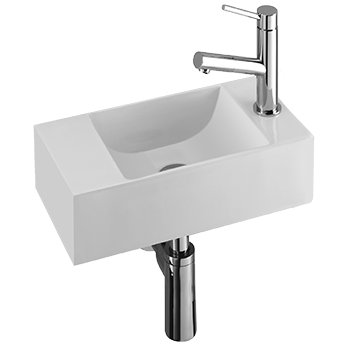 Wash-fountain with 270 mm topmorent in 7 mm Ceramic, U-Shaped wall-bracket of polished stainless steel, no overflow, with taphole, including chromed spacer-ring and set of bolts. 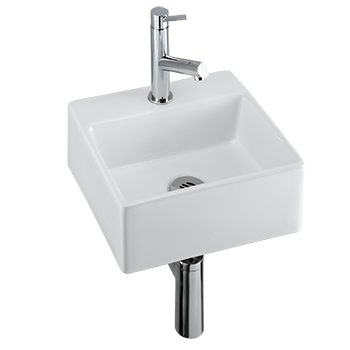 Größerer Waschbrunnen, Ausführung wie BW 181, jedoch Keramikbecken mit 32 cm Durchmesser. 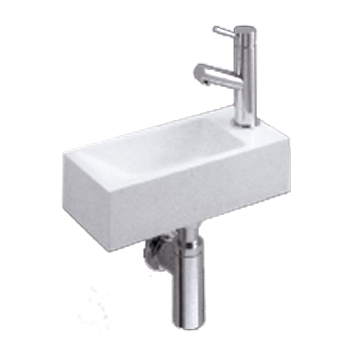 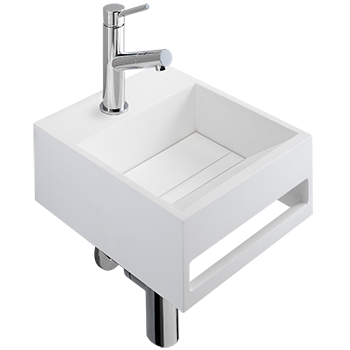 Cloakroom basin 500 x 145 mm, of mineral resin , colour white, taphole right(or left), large putdown space, no overflow, set of bolts included, accessories as indicatet. 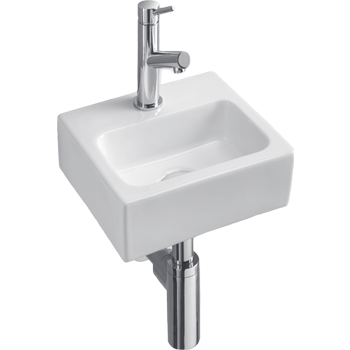 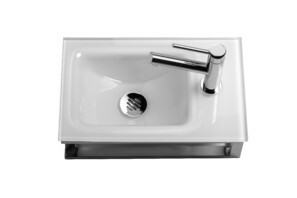 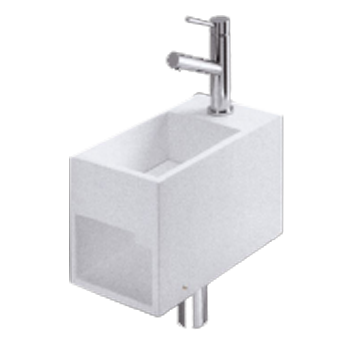 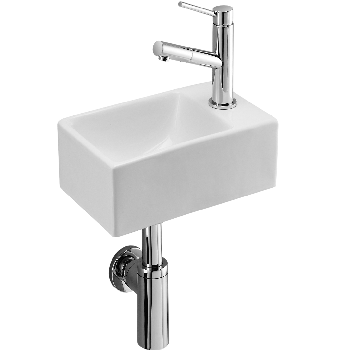 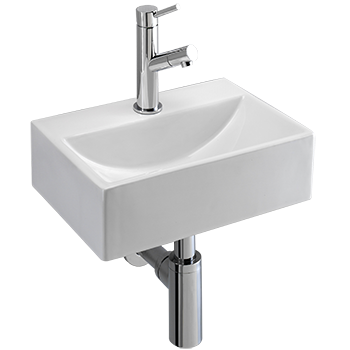 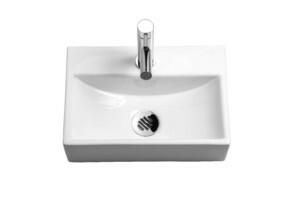 Cloakroom basin 480 x 165 mm, of Mineral resin , colour white, taphole right(or left), large putdown space, no overflow, set of bolts included, accessories as indicatet. 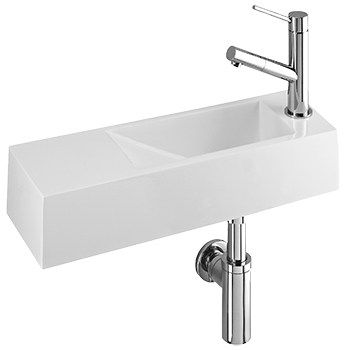 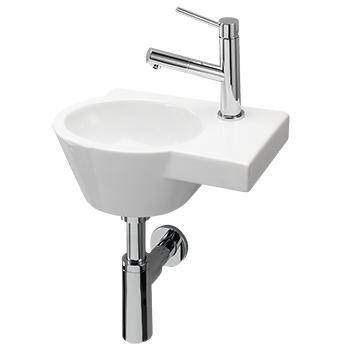 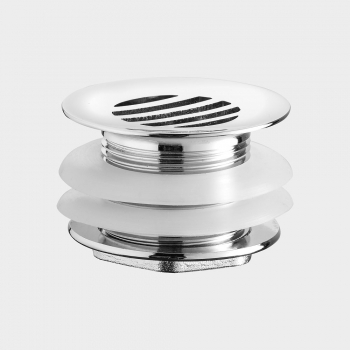 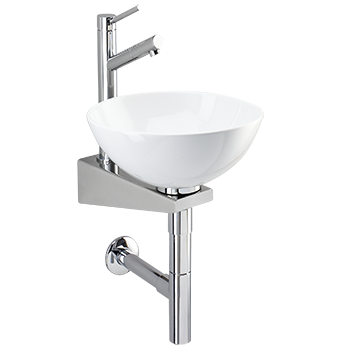 Cloakroom basin 400 x 180 mm, in glossy resin , colour white, taphole right (or left), no overflow, set of bolts included, accessories as indicatet. 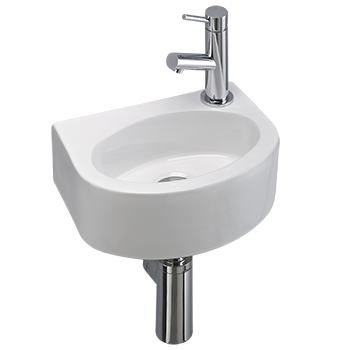 Cloakroom basin 350 x 200 mm, in glossy resin, colour white, taphole right, no overflow, set of bolts included, accessories as indicatet. 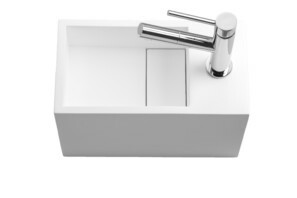 Cloakroom basin 275 x 195 mm, in Glossy Mineral Resin , colour white, taphole right(or left), no overflow, set of bolts included, accessories as indicatet. 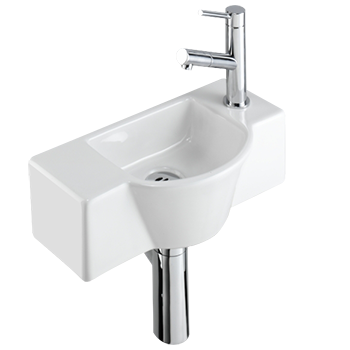 Cloakroom basin 415x207x210mm, in Mineral Resin, colour white, taphole right, no overflow, set of bolts included, accessories as indicatet. 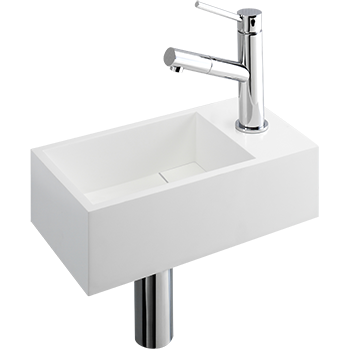 Cloakroom basin 370x225 mm, in Mineral Resin, colour white, taphole right, no overflow, set of bolts included, accessories as indicatet. 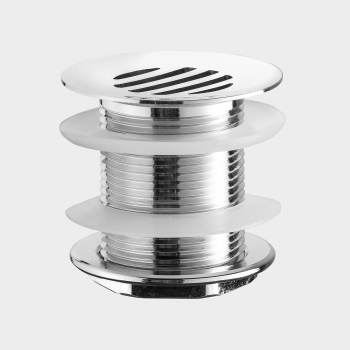 Accessories Paralux drain valve 40 mm, w/o stop effect, Design waste, mixer Artus-Slim, cold, water tap Triade. 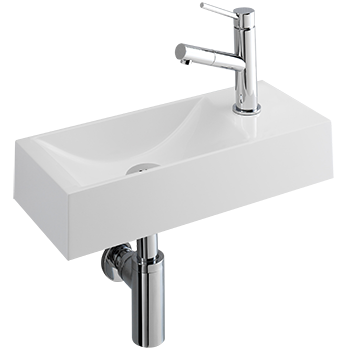 Filigraner Mikro-Waschtisch aus BENESTONE, Hahnloch rechts, wahlweise links, kein Überlauf, Verfügbarer Stauraum links, verdeckter Ablauf, Zubehör wie angegeben. 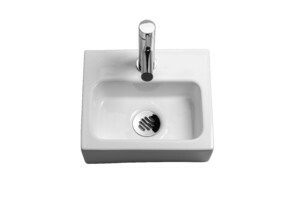 Accessories Paralux drain vavle 40 mm, w/o stop effect, Design waste, mixer Artus-Slim, cold, water tap Triade. 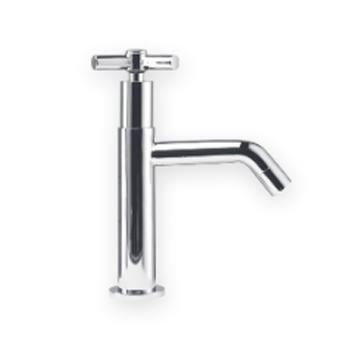 Accessories Paralux drain valve 40mm, w/o stop effect Design waste, mixer Artus-Slim cold, water tap Triade. 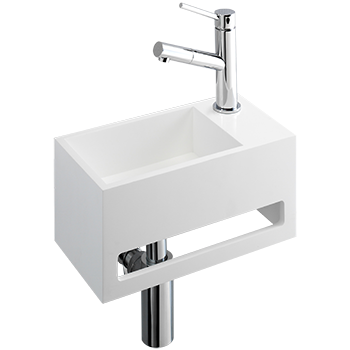 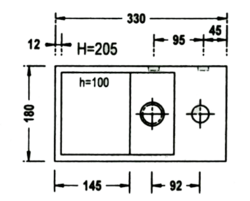 Square-shaped Cloakroom basin 300 x 280 x 120 mm, with interated towel-bar, in white-mat solid surface BeneStone, concealed drain, no overflow, set of bolts included, accessoires as indicated. 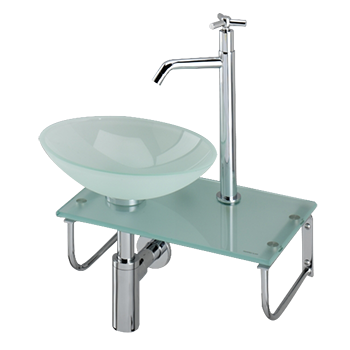 Cloakroom washtable 400 x 250 mm of tempered frosted glass, with oval topmount basin, taphole right, no overflow,towelholders as supports, spacer-ring and set of bolts included,accessories as indicated. 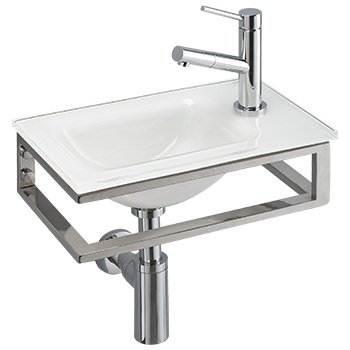 Cloakroom washtable 400 x 250 mm, of tempered glass, colour as specified, cromed game of stainless steel, dubing as towel-bars, taphole side convertible, no overflow, 60 mm dome-valve and set of bolts included, accessories as specified. 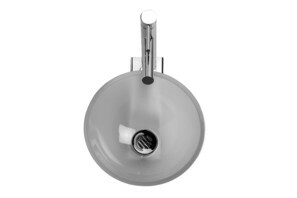 Standard version Taphole side convertible, no overflow, 60 mm dome-valve and set of bolts included. 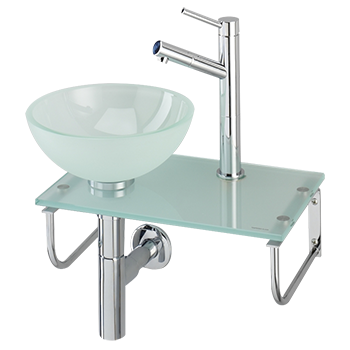 Cloakroom washtable 400 x 250 mm of tempered frosted glass, with topmount round 27 cm basin ,tapole right, no overflow, towel-holders as supports, spacer-ring and set of bolts included, accessories as indicated. 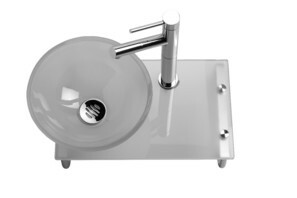 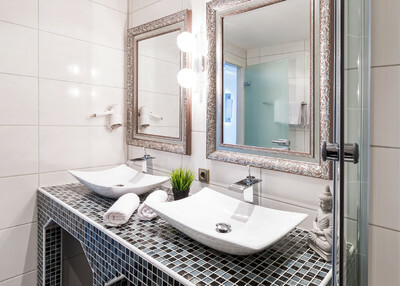 Wash-fountain with 270 mm round glass basin on u-shaped wall-bracket of polished stainless steel, no overflow, with taphole, including spacer-ring and set of bolts, accessoires as indicated. 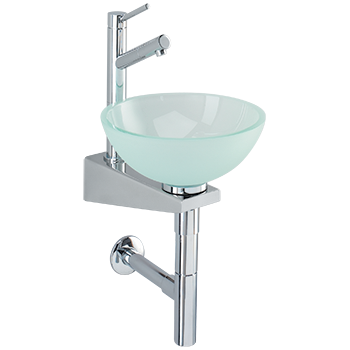 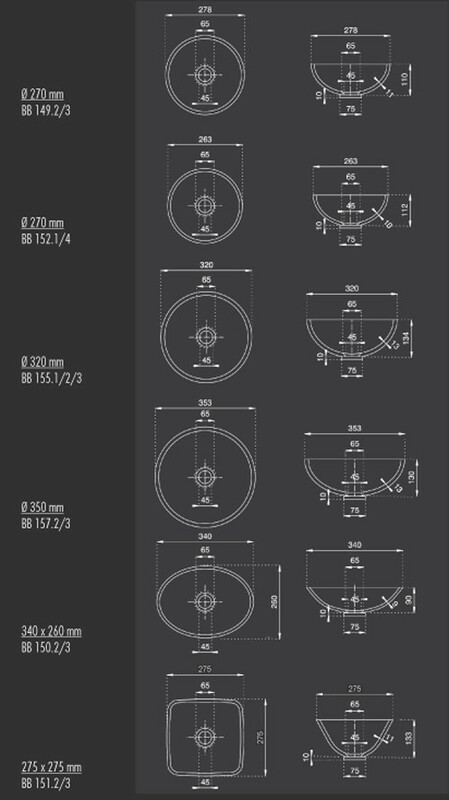 Wash-fountain with 320 mm round glass basin on u-shaped wall-bracket of polished stainless steel, no overflow, with taphole, including spacer-ring and set of bolts, accessoires as indicated. 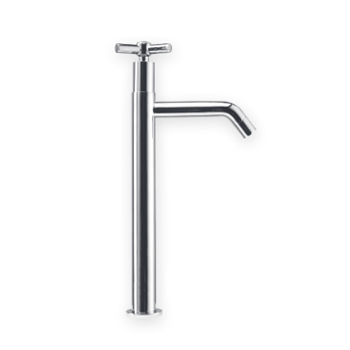 Schlankes Standventil mit einem Durchmesser von 28mm mit 3-Finger Griff, ohne Exzenter. 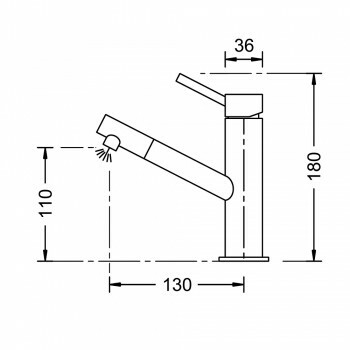 Die Standventile mit 3/4 Zoll Anschluss, werden ohne Flexschläuche geliefert.